I finished the fronts of Oblique this weekend, got the ends woven into all of the pieces and their next stop is a nice soaking before I block everything. 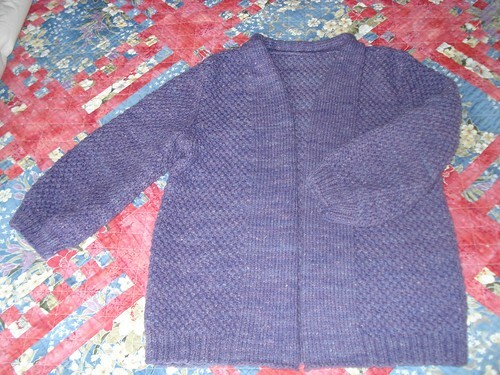 Once the pieces of this sweater are blocked, I can sew them together and add front bands. I will need to find some buttons for the sweater before I do front bands so I can make sure the buttonholes fit the buttons - funny how that's usually a good idea. I need to spend some time over the next couple of days finishing the book sock so I won't be casting on for a new project just yet. For those of you who believe you have missed MS4 sign ups, you haven't. MS4 has never opened for sign ups so it certainly hasn't closed. If you reread the last paragraph in Friday's post you'll see that I was referring to MS3 being closed. MS3 was 2007's Knit Along. It's closed. MS4 will run later in the summer of 2008. It hasn't opened yet. I sent an email out to the Pink Lemon Knits group also trying to clear up the confusion. I don't know if the problem was a misreading of my post or if there are rumors going around the Internet, but you haven't missed anything. I promise. I plied the Rosebud yarn (Corriedale from May's Spunky Eclectic Fiber Club) and tossed it in the washer to finish it and full it. Yes, I did agitate it some (I stood right there by it - for emotional support I guess). By fulling the finished yarn, it encourages the yarn to fluff up and bloom, making a loftier yarn than you would otherwise have. There's a great article on fulling finished yarn in a recent Spin Off magazine by Judith MacKenzie McCuin. Just be careful - if you try to full a longwool, you will end up with felted yarn, so make sure that your wool is something to full before you start. I'm really happy with the yarn. I forgot to double check wraps per inch, but at a guess, it's slightly larger than worsted and I got over 300 yards of it. Remember how I stripped the roving lengthwise and kept the colors in order so I could have the yarn shift colors across all three plies at approximately the same time? Yeah, that didn't really happen. I ended up with a LOT more singles on one bobbin and the whole color shift thing turned into a festival of barber poling, but for some reason I'm not upset about this - the finished yarn makes me really happy! I probably should have rewound the bobbins of singles so I could have started plying with the beginning ends of the singles, where the colors would have matched up perfectly, but that sounds like way too much work for a spinning project that was purely for fun. Oh and to Anonymous who is trying to sign up for MS3 and mentioned in the comments that the group doesn't exist- that was last years Mystery Stole KAL and it closed to new sign ups in July of 2007. If you were a member of MS3 and can't find it, I sent out Special Notice emails saying I was going to close the group in May, then forgot to close it, so I decided to close it June 15, sent out another Special Notice email to that effect, and actually closed the group earlier this week. No official dates for MS4 yet -stay tuned. I'm getting very creative on the blog titles, no? Yesterday I decided to do what women do when we get bored - I rearranged the furniture. It wasn't so much that I was bored, but that I was tired of it being where it was and since it needed moving so I could vacuum it and where it had been sitting, why not rearrange it? I got Caleb to help me with it and he thought it was a whole lot of fun to redo the room. Finn thought the vacuum cleaner needed a lot of barking at, so he helped too. By the time we got it all done and arranged and put back together (why are there always goldfish crackers in the sofa?) we were pretty wiped out, so last night I just worked on the Oblique fronts some more. Since I wrote down the row numbers for the shaping from the back, all I have to do is pay attention to the specific row numbers where I have to decrease for the waist so it really doesn't take much mental exertion on my part. Then there was also the fact that I had to keep getting up so I could reposition Finn's bed (four times) because with the new furniture layout, I wasn't sure where he would want it. Just because his bed fits certain places and looks nice there, doesn't mean the dog thinks that's a good place to sleep. We finally settled on a corner between a chair and the sofa where he can sit near me, but be out of the way. It's also by a window so I can open it for him during the day and he can watch things outside. I've gotten a bit more done on the Oblique fronts. I've set up the stitch patterns and have actually barely begun the waist decreases at this point. Once I got past the twisted ribbing and got the stitch patterns begun so I could see what I was doing, it started moving along nicely - I just haven't taken much time with it over the last couple of days. I would love to get the fronts finished soon so I can finish the sweater because I've got the next sweater sitting here in skeins waiting for me. For some reason, I just noticed that July starts next week. Am I the only one who thinks that maybe it's too early for July? I know school goes late up here in VA (later than my school ever did), but this is crazy! How did this happen? Over the weekend I finished spinning the third bobbin of Rosebud singles and once they get a few days for the twist to even out, I'll ply them. Most people recommend plying when your singles are fresh and the twist is at it's most active*, but since I finished the first bobbin about a week ago, there's no way the recently finished bobbins will have the same level of twist. After attempting to ply singles with different levels of active twist when I first began spinning, I figured out that it just doesn't work for me very well. I can still get a balanced yarn, but the singles coming off the bobbins get really squirrelly and cause all sorts of problems if some are active and others are more dormant. *When you spin a singles yarn, immediately after you spin it you have what's called "active twist." This is really a nice, technical way of saying that if you were to take your singles off the bobbin and try to wind a skein, you would have a crazy mess. Once the singles have a chance to sit on the bobbin for a bit (even 48 hours makes a huge difference in how singles behave), the twist begins to be "set" into the fiber and the singles will be less twisty and crazy. Once you add steam or water to the singles, it reactivates the twist and it goes back to having active twist. Usually when you steam or soak the yarn, it's not as a singles, but as a plied yarn and when the twist reactivates, it is controlled by the plying twist (opposite to the original spinning twist) and they even each other out. I'm on track on my sock project schedule so I've had a chance to get the spinning finished on the second bobbin of the Rosebud Corriedale. This is practically spinning itself! You can see more of the different pink and wine colors in this bobbin. I'd love to get the third bobbin of singles spun up this weekend, as well as get more done on the Oblique fronts, but now I'm off to work on the sock project for today. I've (barely) started the fronts to Oblique! For some reason, I've had to tink more on the twisted ribbing than anywhere else in this cardi - and the sleeves and back have 3 different stitch patterns going on at once. 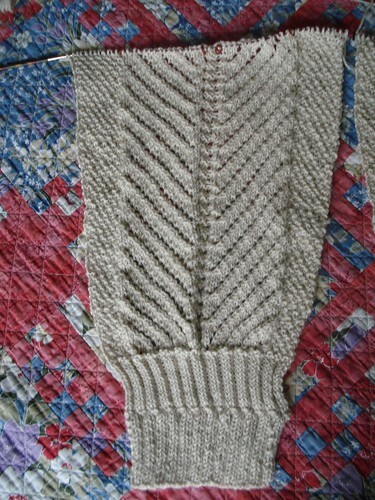 I think it's because typically I can do ribbing on autopilot, but with the twisted stitch, I have to pay attention. I would have hoped that by the time I got to the fronts I would have figured it out, but apparently not yet. 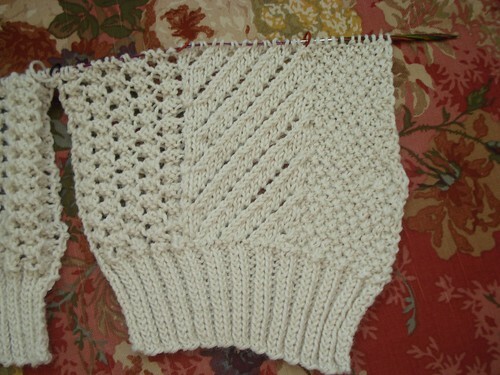 Several times I was twisting the knits when I should have been twisting the purls so I had to go back and fix it. Maybe by the time I get to the front bands I'll have it figured out (not counting on it, but it would be nice). I'm done with the twisted ribbing part of the fronts and once I work the WS row that looks like a row of purls on the RS, I start the fun stitch pattern areas. Thanks so much for the kind comments on the selection of my sock design. You guys are great! I'll be able to give more details on the book when it's closer to being published, but in the meantime, I'll be getting the directions and everything together for the design. I hope you love it! Yesterday was the last day of school around here so Caleb is now a free range second grader! I can't believe the school year is over, but we're so proud of him and how much he learned and did this past year in first grade! 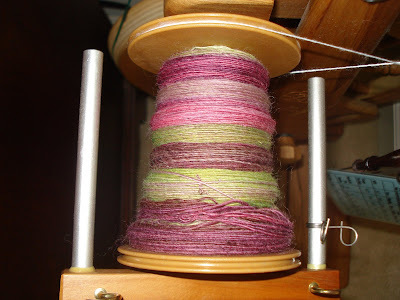 I've been doing a bit of spinning in the evenings and this is what I've started. It's the May Spunky Eclectic Club offering: Rosebud. It's Corriedale wool and since I get the double helping of fiber, I have 8 ounces of it. I split each ball of roving into thirds, lengthwise and kept the colors going the same way as I rewound the fiber for spinning into 3 separate balls. This way, as I spin the 3 bobbins for the 3-ply yarn, my colors will essentially go in the same order and over all the yarn will knit up in stripes. This is not a scientific way of dividing fiber - the eyeballing of thirds of roving is in no way precise - but I've found in the past that it does work out pretty well in the finished yarn. I love the colors and the way they play off of each other. 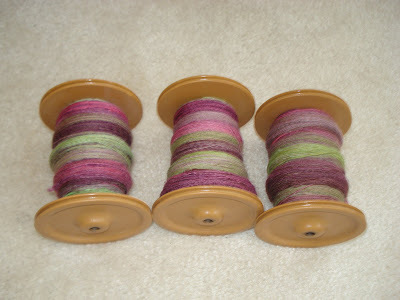 There are more pink tones in the singles than this bobbin is showing. I wanted to give you all a bit of a hint about the Stealth Project I was working on in May, since you were all so patient with me. I was designing and knitting a design submission for consideration for an upcoming sock book from Lark Books. The book is scheduled to be published in the Fall of 2009. I found out at the end of last week that my design was one of their selections for the book! I'm very excited about this but this means two things as far as the blog goes: I have to finish up the knitting and write up the directions in a more official way than it is now and get all of this to the publisher in less than a month AND pretty much what I just told you about being accepted for an upcoming sock book is about all I can tell you at this point - no pictures or any other details. I hope to continue with regular blogging during the time I'm getting thing ready with this sock design, but I might not have blog fodder every day. Fortunately, Ramius has offered to blog for me at least one day so I can work on this, and I think if I stay on the schedule I've made myself it won't be a problem. I finished the back this weekend! There was a brief moment where I thought about adding back neck shaping, but my gut was telling me I didn't have to for a raglan type of sweater, and sure enough, a few minutes later I remembered why - the sleeves of a raglan garment give you neck shaping because of the way the raglan works. Essentially, the tops of the sleeves become part of the neckline. So, once I knew I didn't have to mess around with back neck shaping, it was full steam ahead and I got the back all finished up (except for some ends that need weaving in)! I haven't cast on for the fronts yet, but I will do that later today if I have a chance. As I believe I said Friday, this is a very well written pattern and the only change I've made is to slightly lengthen the sleeves which I have to do for most patterns. You guys know how much I like to change things around from the original pattern, so me knitting straight from the pattern as it's written is saying something. I'm past the bust increases and have about 3 inches to go before I start the raglan shaping, so I feel like I'm going pretty quickly on this piece. 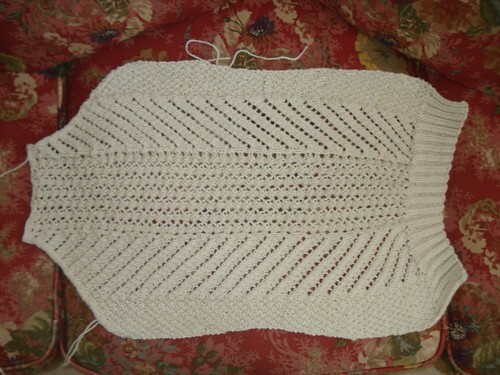 To answer a question from the comments the other day, I am doing the twisted rib stitch as the pattern calls for. I don't think I've changed anything on this pattern except for lengthening the sleeves a bit (which is something I do on most patterns). I'd love to get this finished this weekend and get started on the fronts, but I think the fronts will be a bit more complicated with the waist shaping, neckline shaping, and raglan shaping. It's my birthday! It's my birthday! Oh, waggy, waggy, wag! Yippeee! 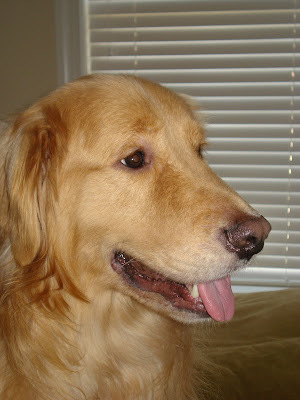 Ok, Mommy just told me to sit down so I could tell her what to type for my blog entry. I love blogging! You guys all leave me the nicest comments. Mommy says I'm two today. I don't know what that means, but when Mommy said that's how many scoops of food I get, I figured that means I'm going to have to lie down and stay and pay attention closely, because Mommy doesn't let me eat when I'm bouncing around like a ping pong ball. She says that's bad manners. I know about bad manners. Caleb uses bad manners sometimes and burps and that's just funny. People have the strangest ideas about what's bad manners. I have big plans today for my birthday. I'm going to pet Ramius today. I've been practicing that a lot. I've seen the humans pet him and he makes that funny noise like our neighbors motorcycle, so I've been trying it. I walk over to him and put my foot on him and for some reason he gets really flat against the ground. Mommy says I'm not really petting him, I'm squashing him, but I think I just need more practice. I hope to get lots of practice today. Yesterday, he actually walked over to me! I wasn't even covered in tuna fish! It was amazing. I was laying on my bed and he walked over to me and looked at me. He even kind of sniffed at me and then he walked off, but HE ACKNOWLEDGED THAT I EXIST! Oh, happy, happy day! The cat looked at me! If he would just give me a chance, I could show him that I would be a good friend to him. I've seen him lick himself a lot. Mommy says that's bathing. His type of bath looks better than my type of bath (I have to go in the rain room - yuck!) and I've tried to help him take a bath. I mean, I've got a much bigger tongue than he does, so if he would let me help with his bath, it would be over much more quickly and then I could practice petting him. He doesn't like this idea very much. Mommy says that Caleb will be getting out of school soon. I love it when he's around. We have lots of fun, and we get really crazy! Caleb is my friend. Sometimes, when it's hot, he eats these really cold, fruit flavored things. The fun part is, he's not that tall, so if I stand right next to him, I can lick one side of it while he licks the other side. It's fun to share with your friends. Speaking of friends, I have to tell you about the new doggy friend I have now that I'm bigger. In the room that has the rain room, there is a counter with magic bowls that have water running in them. Above this counter is a window and there is another dog in this window. He looks just like me! Also, there is a person that looks just like Mommy. I can't believe that I had never seen this other dog, but the day I found him, I spent a long time standing at the counter (just like the people do - on two legs) and barking at him. I didn't want him to think I was going to let him take my family! 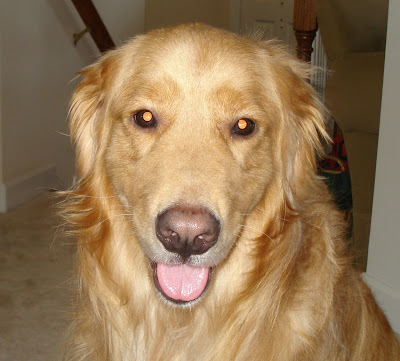 He barked at me too, but now we mostly wag our tails at each other - he's really good looking! I wonder when his birthday is? I'm going to go see if I can get an ice cube from Mommy now. I also need to discuss the number of meatballs we'll be having for dinner tonight. What other numbers are there besides two? Here is what I have so far on the back of Oblique. I'm part way through the waist decreases at this point. Once again, once you get a few rows worked in the various stitch patterns so you can read your knitting, you can zip right along and it knits pretty quickly. I'm really pleasantly surprised by this design - I thought it would be one that needed more attention, but really its pretty easy to work on autopilot. I need to weave in the ends I've got so far because according to Ramius (who has been sitting in my lap while I knit), they are very irritating and keep making him twitch. It's so difficult being a cat around here! I can tell already that when I block the pieces of this sweater out, I will be blocking the ribbing of the fronts and back stretched out. 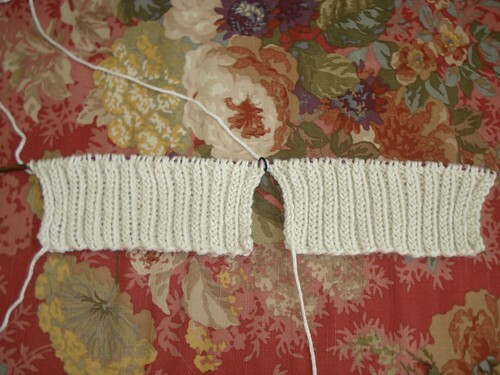 I don't like longer length sweaters with ribbing that pulls in and as you can see in the picture, this is pulling in. I think I'll be happier and it will be more flattering if it just falls straight. I'll let the ribbing draw in on the sleeves so I don't have cuffs flapping around. I mentioned yesterday that I whipped the Oblique sleeves into shape by making them watch me spin. This is what I spun. It started as 3.7 ounces of a Spontaneous Spinning Batt from Loop. It was named (in possibly the understatement of the year) "Pink." This thing is pink like space is big. 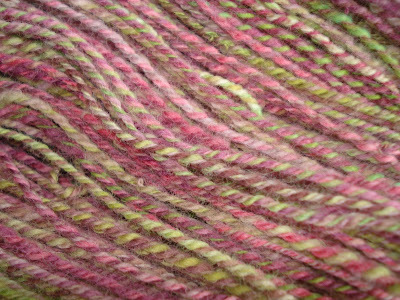 Not only does it have wool, silk, kid mohair, sari silk, alpaca, and Angelina (oh boy, does it have Angelina - there are places in the singles that are JUST Angelina), it has hot pink, red, purple, soft pink, coral pink, mauve pink, and every other kind of pink or pink relative there is. 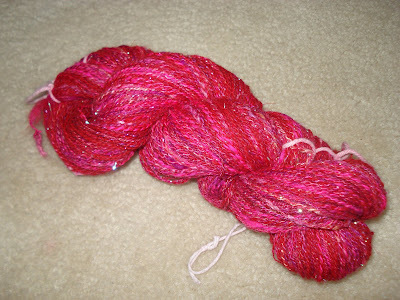 I spun it into a two ply sportweight and I got 261 yards when it was all finished. I'm thinking about making it into the scarf they show in the new Spin Off done 10 different ways. 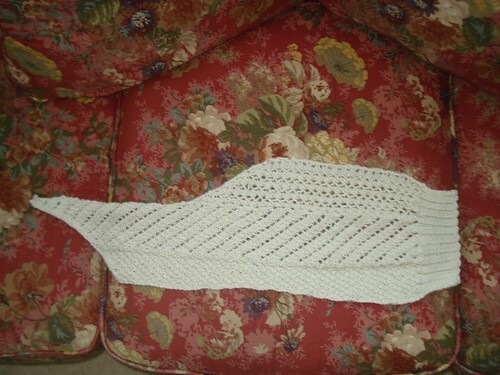 (I can't remember the name of the scarf, Spin Off is upstairs, the computer is downstairs, I'm lazy, but the pattern is by Heartstrings.) I think that would show off the colors the best and while I'll have to Elvis the collar of whatever jacket I wear with it (some of the Angelina is almost tinsel sized and it's not as soft as I'd want against my neck), I think it would look great in that pattern. ...the Oblique sleeves, that is. The other evening, when I knit and knit and they didn't get any longer I put them in time out. They were in time out in the top of the knitting bag, which was sitting right next to the chair I spin in. On Friday, when I pulled out a spinning project - a pink, sparkley, flashy spinning project - they had a front row seat to all the action. I heard a gasp from the knitting bag as the sleeves realized that not only could I come up with something else to work on, but I distinctly heard one sleeve muttering to the other about "Seasonal Wearablility" and "Heat Wave." Clearly, they have seen the light and realized that they could easily be put in time out in a less optimal location, one that didn't get constant doggy attention and wasn't in an area that enabled TV viewing because when I pulled them back out Friday night, they were 1 - 1/2 inches longer than they were Thursday night, with no knitting on my part. I think they were doing the knitting equivalent of sucking in their stomachs to make themselves look smaller. 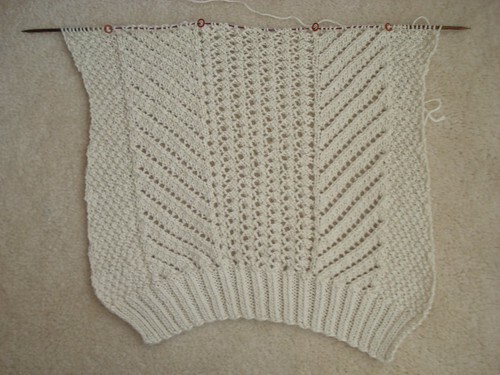 Anyway, we've decided to let bygones be bygones, I've finished the sleeves and started the back. I'll leave the sleeves in the knitting bag while I work on the other pieces of this cardi just in case the back or fronts get uppity - the sleeves can fill them in on the reality that is knitting a Fall cardi in a June heatwave. I'm not going to take sass off my knitting. Oh, and I'll show you the spinning tomorrow! I've clearly made a lot of headway on the Oblique Sleeves. According to the pattern, I'm about 1 inch away from starting the raglan shaping. 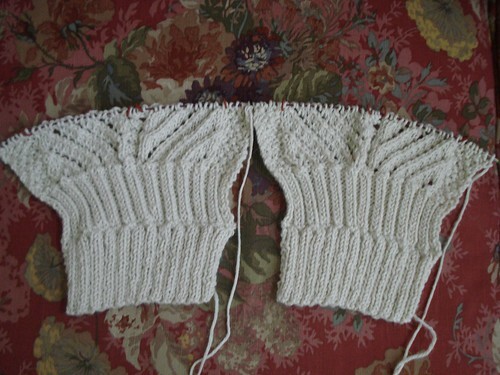 According to my long arms, I'm a bit farther than that from starting the raglan shaping. Last night as I was knitting along, I hit that weird knitting black hole where I kept knitting and couldn't get anywhere - 10 rows and only half an inch. I have no logical explanation for this kind of event, but I know I'm not the only knitter who's had this happen, so instead of blaming a galactic conspiracy (it might be, I don't know) I just put the sleeves away early last night and let them sit in the knitting bag and think about what they'd done. Hopefully later today they will behave better after having the time out. As I said the other day, this pattern really flows nicely. I had planned on charting the lace designs for this sweater but didn't feel like it before I got started so after slogging along through the first full repeat (a whopping 8 rows - I know, it wasn't too painful), I was able to read the knitting and just go for it without referring to the directions too much. (I did write down the row numbers for the increases so I wouldn't forget.) Yesterday I even talked on the phone while I knit and Stockinette Stitch is usually about all I'll attempt on the phone, but I didn't have any trouble with Oblique. I think this sweater would probably be a pretty good travel project for riding in the car. Thanks for all the comments on Finn's first meme. His birthday is June 12, I think that's next Thursday but I don't have a calendar right here. I think he's planning on blogging on his birthday, but I also think he's planning on having meatballs for dinner on his birthday so clearly his sense of reality isn't quite there yet. A couple of days ago I got tagged for the meme that's been going around the knit blogs by Diana of Kvetching Up. Finn asked if he could do it since he hasn't been on the blog lately and he thought it would be fun, so here he is! I wasn't born yet. I won't be two until next week. What are 5 things on your To Do List for today, in no particular order? Goldfish Crackers, Doggie Greenies, Bubble Gum Wrappers, Legos, Cats, Cat Food, and Oh Yeah! That place that the humans call the "Trash" is a great place to get a snack from! This is so obvious the question shouldn't even be asked: buy meatballs of course! Finn won't be tagging anyone in particular, but if you need a blog post, feel free to consider yourself tagged! OK first of all, I must confess, I have no idea why I'm having so much fun with the word "sleevies" but I am. I started on Oblique and I decided to do something different. Since I like to knit both sleeves and both fronts at once and when I do I'm working from two different balls of yarn at once, which makes it either fiddly or twisty, which I hate, I decided to break it up this time. I usually start with the back of a sweater, which I cruise through, partly because it's only one ball of yarn at a time. Then I have to do sleeves and fronts and I'm working with two balls of yarn for the rest of the sweater until it's time to do edgings. This means that I slow waaaaaay down on the sleeves and fronts because of the twistiness and the fidgeting and it's just plain irritating. 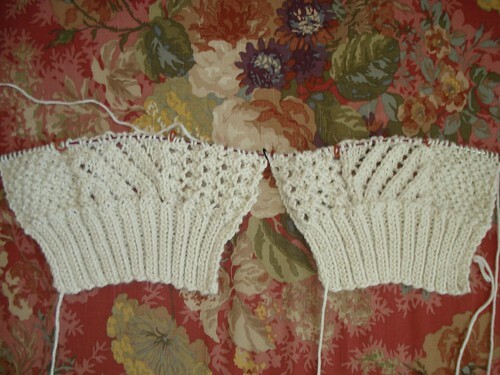 For Oblique, I've decided to start with the sleeves, then reward myself with the back and finish up with the fronts. See? I've broken up the irritating parts. By the time I get to the fronts, I'll almost have sweater, and I won't have any way to convince myself that I can skip the fronts (you can skip the sleeves and have a vest, but if you skip the fronts, you get something not appropriate for this blog), so at that point it's just stupid not to plow straight through and finish. 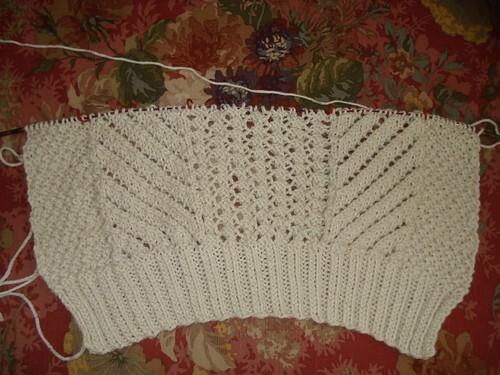 As you can see, I'm past the turned back cuff and have started on the patterning. I thought the patterning was going to be a pain, but after a few rows, it's pretty easy to read and it's not slowing me down. It's not as brainless as straight Moss Stitch, but it's easy enough that I can watch TV with it. I love the way this yarn (Andean Silk from Knit Picks in Cream) is working up in this design and so far, I haven't changed a thing on the pattern! It's not a sweater unless it's got sleeves! This weekend there was a lot of sewing up going on - particularly the sewing up of sleeves. 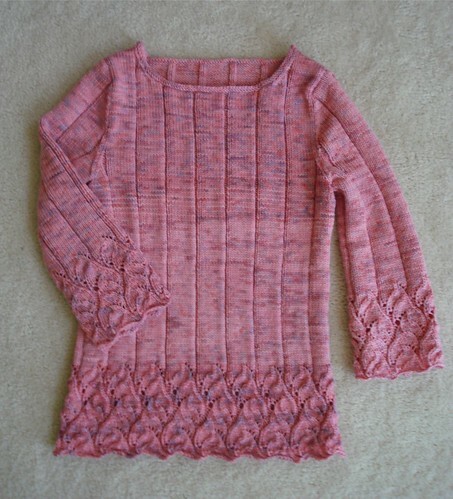 The Highly Modified Chinese Lace Pullover was part of the Loopy Ewe Dream In Color KAL and the finish date was June 1, so that one got finished up first. At this point, it's too warm to wear, but it's finished, folded and waiting for the temperatures to drop. Since it's a 3/4 sleeve pullover, it won't be shelved for too long once September rolls around. 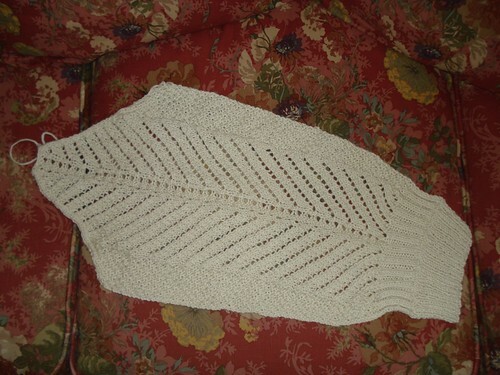 I got it finished on Friday and got the picture posted over at the Loopy Ewe so I did beat the KAL deadline. The yarn I used is Dream In Color's Classy in the Cool Fire colorway. I won't go into all the details about this pullover again, but if you're curious, just click the pullover tag at the end of this post and you'll get more information than you ever wanted about what I did on this sweater. The short version is don't mess around with this pattern, just follow the directions. Trust me on this one.